Businesses across every sector face the same issue when it comes to their staff. They want to attract the best people but they also want to make sure that, once they’ve found them, they keep them in the business. Nobody wants to work in an office where they don’t feel productive, and nobody is going to feel loyalty or pride in a workplace that doesn’t support them. Leesman is the world’s largest measure of workplace effectiveness. Its latest research is based on responses from over 150,000 employees worldwide and shows that only 55% of respondents feel that the design of their workplace enables them to work productively. This can have a potentially significant impact on the health and wellbeing of your workforce demonstrating that good office design is extremely important in relation to staff retention. What does a good office design look like? It’s tempting to think that a few unusual or creative elements in the office (slides and table tennis spring to mind) will be enough to make the working environment interesting and engaging. But to create a happy office the important consideration is your people. What do they want? What motivates them? What environment are they most productive in? Understanding how your employees work is the key starting point, then build your environment based on their needs rather than perceived ideas of what an office should include or look like. Each company and their people are unique and the ideal workspace will vary between different organisations and teams. Officeworks Workplace Consultants are specialists in analysing organisations to understand how the dynamics of their workplace function. 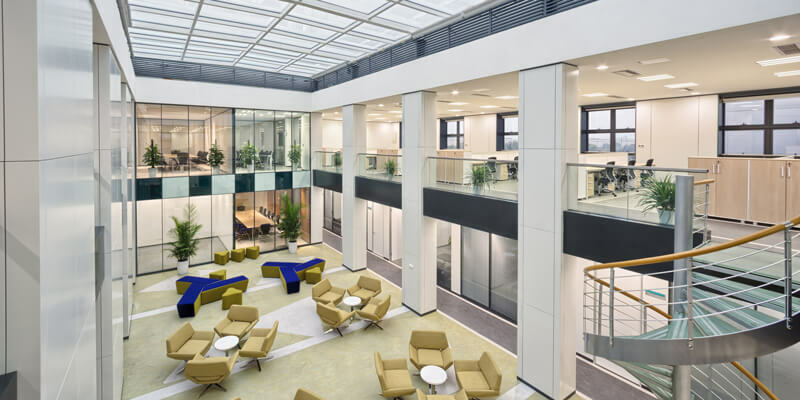 Our Expert Walkthrough looks at all the factors that affect working conditions such as natural light and noise levels, ambient temperature, furniture design and space utilisation. We can also conduct tailored staff surveys ensuring that your office design incorporates elements that specifically benefit the people working there. A workplace design should reflect the organisational values and culture, giving potential employees an idea of the kind of environment it is to work in. For example, a company with a variety of working environments such as open plan areas, focus pods, breakout areas including sofas and bean bags, would reflect a culture of creativity, collaboration and flexible working. 1. Variety of spaces – give employees a choice of environments to work in so they can perform their best. Multi-dimensional spaces empower staff to choose the areas they wish to work in and are most suitable to successfully complete different tasks. 2. Company culture – staff will be attracted to a professional culture that cares for staff wellbeing and displays strong values. A new office fit-out project is the perfect opportunity to put the heart and soul of your business onto the walls of the office. 3. Remove clutter – it sounds obvious but clutter reduces productivity and in the digital age there’s really no need for it. Invest in a good filing system for dealing with clutter and make sure a good network filing system is in place. 4. Add colour – colour is inspiring and motivating and can play a huge part in how effective your office design is. Good use of colour can help you to represent your brand personality and create a happy and healthy environment. 5. Break out areas – studies have repeatedly shown that employees are more productive if they’re able to have regular breaks in social break out areas to clear the mind and re-focus. Hopefully we have demonstrated the importance of investing in your workplace. With an increasingly challenging talent market with candidates now expecting to work in an environment that allows them to maximise their potential, investing in a workplace that attracts and retains the very best talent is crucial and should be viewed as an investment. If you’d like to find out how the team at Officeworks can design an office that attracts and retains the best people in your sector, get in touch today.